“TRANSITIONING FROM MIGRATION: Africa is often regarded as a continent of migration, of countries described vividly […] as ones that citizens flee from. African literature can contribute to our understanding of the causes, processes and aspirations that perpetuate this trend. In this way African literature invites us to imagine an Africa of options beyond migration. This round table gives interested guests the opportunity to engage with this topic.” (extract from the programme) This opening round table brought together this year’s curator Tsitsi Dangarembga (Zimbabwe), last year’s festival curator Olumide Popoola (Germany/UK), and Ellah Wakatama Allfrey (UK/Zimbabwe), who was introduced as a “grande dame” of African publishing. Sandra van Lente attended this opening round table about literature, reader involvement, power structures and access to means of production. The African Book Festival opened its doors for the second year in Berlin at Kino Babylon. It is a great opportunity to meet loads of African writers, engage in lively discussions and browse the well-stocked book table. Filmmaker, screenwriter, novelist and activist Tsitsi Dangarembga curated this year’s programme with Ben Okri as ‘headliner’ and about 48 amazing guests, 30 of them women, 10 panel discussions, 3 performing poets and 23 tête-à-tête sessions (link to the list of participants). The main questions at the opening roundtable were about how the panellists understood the topic “Transitioning from Migration” and which role this played for their work and lives. Activist, novelist, playwright, filmmaker, and this year’s curator Tsitsi Dangarembga invited us to think about migration and movement in different ways, not just about immigration to the global North, but also in terms of languages, ideas, etc. ; not just as a process of arrival, but also of leaving and the impulse behind it. Olumide Popoola told us she could not help but think about the rise of the far rights all over Europe – their becoming “salonfähig”, as she put it – not least the looming Brexit and the xenophobia that surrounds it, and how this affected writers. 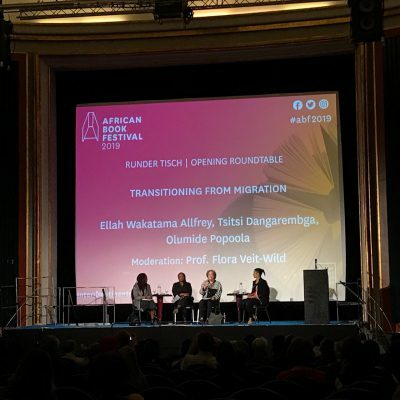 This festival and its topic opened up more perspectives on African literature – “and we know it’s not a genre” – and shows it has so much more to offer than the often quoted stories about migration. This very festival, for example, features a panel on Veganism, “not the first thing that came to mind thinking about African literatures,” she added with a wink. For Olumide Popoola these are exciting times for new and visionary texts, women writers, and also about asking questions about who is speaking – and who is analysing. Ellah Wakatama Allfrey is the founding publishing director of The Indigo Press (link), a writer and critic, who also used to be an editor for Jonathan Cape and Granta magazine, and who has acted as a judge for numerous awards (coming up next: the Caine Prize for African Writing (link)). She understands “transition from migration” as an internal movement, of “being and becoming”. And she made some powerful statements about power structures, means of production and about making audiences see things and people previously unknown to them through literature. Ellah Wakatama Allfrey drew our attention to questions of power and decision making processes at the publishers’ tables and that not everybody gets the same chances – being funded or published to name just two examples. Olumide Popoola reminded us how Bibi Bakare-Yusuf (Cassava Republic Press) would tell us “we need to take the power back”! “You can’t be trusted,” Bibi Bakare-Yusuf lets her Berlin audience know right away. What Europeans picture when talking about African literature only catches a tiny fraction of it. The publishing of Tsitsi Dangarembga’s trilogy – Nervous Conditions (1988), The Book of Not (2006) and This Mournable Body (2018) – took that long because it was deemed too difficult by a number of publishers. Tsitsi Dangarembga shared with us how her despair led her to publish some sections on facebook in order to get people’s attention for her text. She received one reply: a reply from Ellah Wakatama Allfrey, an encouragement to send her the manuscript once she was ready. All three novels are published now and critically acclaimed. The “danger of a single story” is known – not least thanks to Chimamanda Ngozi Adichie (link to Chimamanda Ngozi Adichie’s TED talk). The three panellists talked about remarkable books that challenged this ‘single story’ and inserted so far lesser known stories into the literary and public sphere. Ellah Wakatama Allfrey shared with us how she wrote about her great-uncle and how she rejects the term “forgotten soldiers”, because it’s only the white historians who have forgotten about them, not their families and communities. She also shared her joy when she realised how the audience started to see her great-uncle through her words and concludes, that we must not leave the writing – be it fictional or historical – to those in power. And she told us how there are already so many new stories around that change the literary landscape. One of her examples that also inspired others was Kintu by Jennifer Nansubuga Makumbi, telling the story of a fictionalised Uganda omitting and thus eradicating the British from the story. Tsitsi Dangarembga added that she hopes that readers will engage with perspectives and stories in African texts, in particular readers from the global North. And she hopes that this engagement will also continue once the book is closed. That a transition from literature to our daily lifes and politics was possible. But what was even worse was that the chair did not always seem to get the point and/or understand the position from which she was speaking. This became particularly apparent in the Q&A session with the audience. One person from the audience asked about archives, access and power structures, in particular how to deal with the fact that the archives are often not owned / paid for by the people affected by the archives but by institutions of the global North. Those who put together these archives also impose their own perspective on it. First of all, the chair accused the person of not asking a question. And secondly, the chair commented on the question herself, pointing out that Humboldt University had a great Dambudzo Marechera archive. Yeah, well, q.e.d. As Ellah Wakatama Allfrey and Tsitsi Dangarembga both pointed out: it was high time to take back the power, and archives play an important part in this context. Otherwise the very powers and perspectives that many authors and activists aim to dismantle are just being reinscribed. The three women at the roundtable agreed: it was great to see what’s possible now compared to thirty years ago and one goal should be to find alternatives to the status quo and have African writers, filmmakers, activists etc. take back the power. How to go about? Olumide Popoola highlighted how important it is to uplift others and keep the door(s) open – no matter whether you coach people in their creative writing process (as she does) or whether you have made it into one of the gatekeeping institutions and can help other African voices to be heard better. When talking about the nature of cultural production, of inserting new stories and of the difficulties doing so if you’re not part of the gatekeeping institutions, Tsitsi Dangarembga adds that “a narrative is complete once it is in someone else’s head.” Hence the importance to (also) get a foot in the doors of institutions of cultural production. For Tsitsi Dangarembga, this festival was chance to open doors, but also to engage with one another and speak about uncomfortable truths. That would be an awesome transition from the status quo. The festival is on until Sunday, 7 April. Don’t miss it if you have a chance to go.